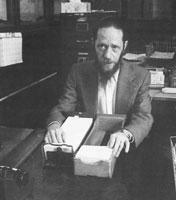 John Hughes is pictured above in the Butte-Silver Bow Archives, in 1982. He worked as the archivist before taking a job as reference librarian at the Butte-Silver Bow Public Library. Josh Peck didn't have the Internet eight years ago when he was a high school student working on research projects, but he didn't need it anyway. His first choice for reliable information was at the Butte Public Library's reference desk. His name was John Hughes, and he seemed to know everything. "He was the best reference manual in the reference part of the library," said Peck, 25, director of history at Atlantic Richfield Co. "He was the Internet before there was the Internet. It was like opening a book, sitting and talking to him." Hughes died April 10 at age 70 of lung disease. His friends said Friday they will miss his institutional memory, quirky passion for Chinese culture and fascination with history. "He was the one everyone turned to when we needed help with Butte history," said Ann Drew, library director. Libraries were in Hughes genes; his mother was a librarian. He studied Chinese at the University of Seattle, and later took a job as archivist at the Butte-Silver Bow Public Archives before becoming a reference librarian here. During his 21 years on the job, he earned a reputation as a reliable source on almost everything — from Chinese culture to genealogy. He retired in January. "He had certain followers who would just come in and talk to him," said Diane Giop, Hughes's co-worker at the library. "He loved to talk about philosophy and Chinese culture." It was hard, even for Hughes, to pinpoint exactly what drove his interest in Chinese history, but he told the Standard in 1982 that it started with the public's confusion over a certain philosopher. "I was annoyed at people who unwittingly or intentionally attributed things to Confucius which he didn't say and I decided to study Chinese to find out exactly what he did say," Hughes said. He spoke Chinese fluently and was often a historical consultant on projects relating to Chinese culture in Butte. He once gained notoriety for solving a tricky Chinese riddle about Butte's name, which he claimed to have done in his sleep. He also spoke Russian and German, which made him invaluable in summer when foreign tourists were in town. "Someone would come from Russia or wherever and they would just be amazed that we had someone who could talk to them," Drew said. When he wasn't working, Hughes collected stamps and listened to music; he played the bassoon in a military band while serving in the Army. When his mother died, Hughes donated a series of "The New Grove Dictionary of Music and Musicians" to the library. "He loved the library, and he loved what he did," Drew said. Services are planned for Tuesday. A full obituary will run in Sunday's paper. Erin Nicholes may be reached via e-mail at erin.nicholes@mtstandard.com.